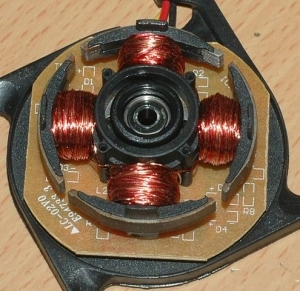 The four poles on the stator of a two-phase brushless motor. Brushless DC electric motor (BLDC motors, BL motors) also known as electronically commutated motors (ECMs, EC motors) are synchronous motors that are powered by a DC electric source via an integrated inverter/switching power supply, which produces an AC electric signal to drive the motor. In this context, AC, alternating current, does not imply a sinusoidal waveform, but rather a bi-directional current with no restriction on the waveform. Additional sensors and electronics control the inverter output amplitude and waveform (and therefore, percent of DC bus usage/efficiency) and frequency (i.e. rotor speed). Mr. Michael Robbins, who resides in Northern California, is our drone tech expert with over 30 years of experience. He started his career building gas powered UAVs at age 12. He has since earned a Bachelor's of Science degree in Design and Engineering and is AutoCAD certified. He has worked with the Monterey Bay Aquarium, Animal Planet, Travel Channel, Hearst Castle, CNN, Adobe, Oracle, HP, Cisco Systems, Discovery Channel, National Geographic and NASA. With a passion for aviation, Mr. Robbins spends his spare time studying for his Commercial Pilot’s License.